Harry Collins was born in Gloucester in July 1879, the fifth son of Daniel, a waterman, and Acquilla Collins. He worked as a labourer at Priday, Metford and Company Limited until, after providing misleading information about his age, he enlisted in the British Army on 29 September 1894 and served in the Boer War (1899-1902) with the 1st Battalion, Gloucestershire Regiment as Private, 4400. Harry was one of the defenders of Ladysmith which was besieged by the Boers for 118 days, being eventually relieved on 28 February 1900 by a British column; the news of the relief was greeted by rejoicing crowds throughout Gloucester, the main streets of which were decorated with bunting and Union flags to celebrate the event. On 22 January 1903 Harry returned to civilian life in Gloucester although still remained an army reservist and was re-employed by Priday, Metford, initially as a stoker and later as an engine driver. Within six weeks of his return he joined the Gloucester Football Club and played his first game against Northampton on 14 March. He played back row forward, who “proved [his] worth [and] distinguished himself…in the loose…” He made 102 appearances for the club between 1903 and 1908, of which ninety-nine were for the First XV. Harry was a regular in the pack in the 1905-07 seasons, being the leading player in terms of the most appearances, 32 in the 34 games, in the 1906-07 season. His last game was against Coventry on 1 February 1908. 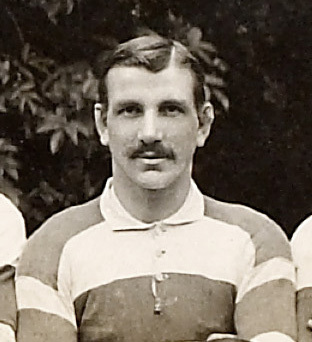 He scored nine tries during his Gloucester career and was awarded two Gloucestershire County caps in the 1905-06 season. Harry’s choice of Club was probably influenced by his elder brother Albert Collins (1869-1924), who had previously made 132 First XV appearances between 1889 and 1895 at half back and in the forwards, scoring twenty-eight tries. On the outbreak of the Great War in 1914, Harry lived with his wife, Florence, and their three children, aged seven, five and two years, at 2a Clare Street, Gloucester. On 3 September 1914 he signed up at Shire Hall for one year’s service or for the duration of the war as Private, 9259, with the 6th (Reserve) Battalion, Worcestershire Regiment, but as a trained soldier was immediately transferred to the 1st Battalion and landed at Le Havre on 5 November 1914.
the cause of the accident by touching the trigger as he received the rifle. [Harry] was in hospital at Boulogne [for] four days and at Clacton on Sea [for a further] fourteen days” On 13 April 1915, the Army Medical Board discharged him as permanently unfit for active duty due to a bullet wound received on active service with the “Forefinger of right hand missing. Has been amputated at metacarpo-phalangeal joint.” As a soldier without a trigger-finger Harry was ineffective but despite the absence of left-handed rifles he taught himself to shoot and bayonet fight with his other hand and after 319 days, on 25 February 1916, he was back in France, this time with the 10th Battalion, Worcestershire Regiment. Harry did not need to return to active service as he had already “done his duty” but on 1 July 1916 he found himself with the 10th Worcesters billeted west of Albert in the reserve line for the Somme Offensive. The battalion moved into the front line on 3 July to take part in the second assault on the fortified village of La Boisselle. At 3.15 am the infantry moved into the ruined village to engage in what the official regimental history described as “hand-to-hand [fighting] at point blank range, with bombs, bullets or cold steel [and with] the first light of dawn…the fighters [who were now able] to recognise each other with certainty…the struggle reached its climax.” Harry survived the assault on La Boisselle but as the Germans were driven out of the village they sent up red flares as a signal for the German artillery to launch a bombardment on the village now clear of German troops. The British soldiers immediately took cover in the abandoned German dugouts but Harry was buried beneath debris and subsequently died during the bombardment on 4 July 1916. His body was never recovered and identified. The fight for La Boisselle also claimed the life of Private John (‘Jack’) Price (1887-1916) (back row, twelve appearances for the Club between 1909 and 1911), while Sergeant Arthur (‘Ronk’) Saunders (1891-1916) (back row, forty-nine appearances for the Club between 1911 and 1914) won the Military Medal for gallantry whilst in charge of a machine gun; Arthur was subsequently killed in action on the Somme on 1 November 1916. The bodies of all three players were never found and they are commemorated amongst the missing on the Thiepval Memorial. On 16 January 1917, the War Office officially listed Harry as Killed in Action and his wife Florence Collins was awarded a weekly pension of twenty shillings and six pence for herself and the three children, a reduction of two shillings and six pence from the money she received from the government when Harry was still alive.